In 2011 I began to jot down VIN numbers of cars that seem to be Abercrombies. I will add to the list as I find them. VIN 268 - body and windshield only, was reported for sale in early 2014. Owner said it had Abercrombie badge on it. looks like 2WD from the album pic. Glassic built about 20 to 30 cars for Abercrombie & Fitch to sell primarily through their Christmas catalog under a promotion of "for the man who had everything". Most of them were sold through West Palm Beach and Miami, and the cars were "charged" to a particular store. This was not great for the store's profit page since cars usually had a much smaller markup than other high priced items. 2008: One Abercrombie ad said they only had 4 for sale (perhaps at that time) and another ad said that only 7 were made. That Abercrombie ad was spotted as "for sale" on eBay. - the source of the ad page was not mentiond. 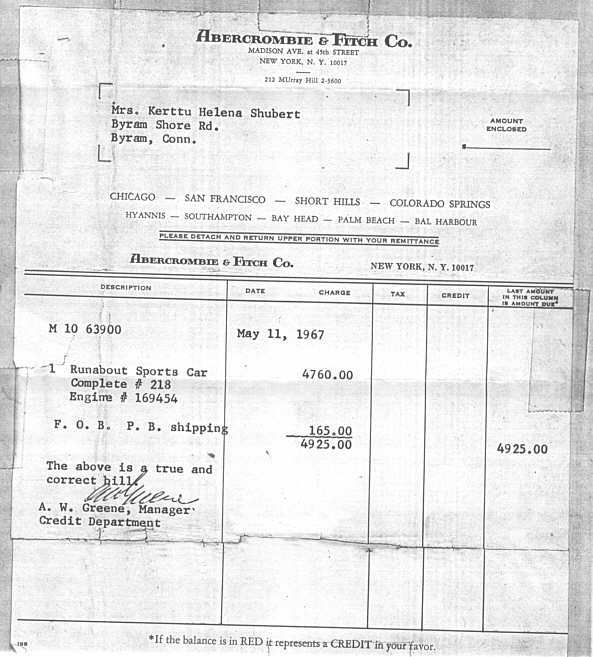 Among the cars built for Abercrombie were some 4 -wheel drive models - which presented a particular challenge for Glassic since there was limited floor space inside the cars to start with. 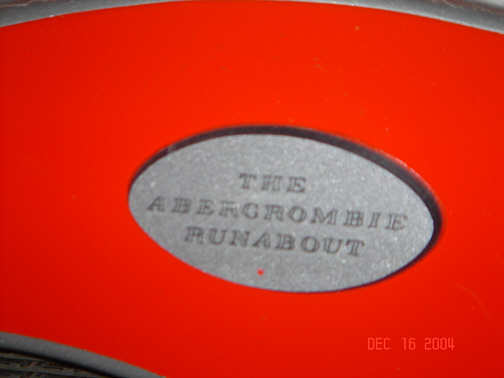 The cars sold by Abercrombie were essentially the same as regular Glassics, except that they had a custom made medallion in the front that said "Abercrombie Runabout" - the word Glassic did not appear anywhere on the car except for the VIN tag. Joel also reports that there were, at the time, TIES sold by Abercrombie with a picture of a Glassic on them. Something to watch for in flea markets! There were 12 4WD Abercrombie Runabouts built - all at the same time and they were featured in the Christmas Catalog... the only thing special that I remember was the emblem on the radiator shell and the quail on top... that's about all I remember about that subject....(Joel) -- Upon further probing, Joel added that there were some 2-wheel drive vehicles built as "Abercrombies" as well as the dozen 4WD vehicles that were special-ordered for Abercrombie. Pictures of the Abercrombie & Fitch catalog. The photos below are Jack's purchase from the 1967 Abercrombie & Fitch Christmas Catalog. Jack also shared pictures of the catalog. See link near the top of this page. 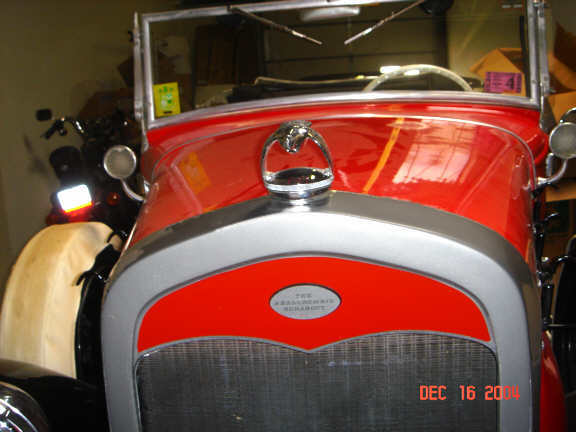 Thanks to Jack, the owner, for these pics of his car # 269, with its Abercrombie name plate on the radiator shell. A close-up of the Abercrombie nameplate on car 269.